I was very much impressed by SriPriya’s way of preparing mango ice cream. From the day I saw the mango ice cream in her blog, I wanted to try it out! Finally I got a chance to do it. The taste was too gud. Blogging has helped me to learn so many new recipes, ideas and much more. Thanks to all my friends. Blend it in a mixer and freeze it. After an hour, blend the frozen ice and again set it in the freezer. Repeat this for 2 -3 times and then deep freeze the ice cream. Garnish with mint leaves and serve chill. 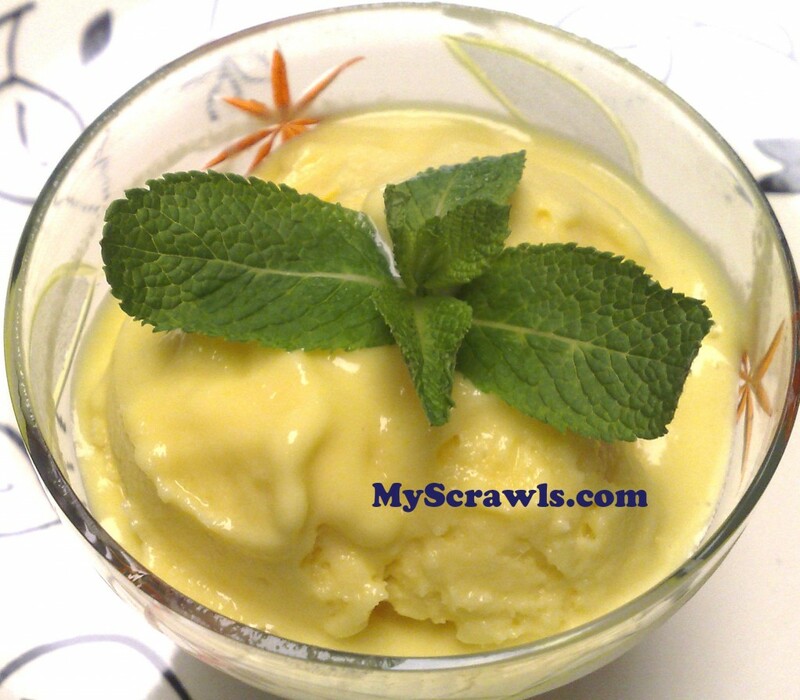 Yummy icecream Anu..I make the same way..when i make this Whenever i open the freezer,kitchen used to be filled with nice aroma as if there are dozens of mangoes stored in the house..Love the flavor and taste of this icecream. Perfect summer treat!You could send this to bookmarked recipes being hosted in my blog if u like. Hmmm. Yummy ice cream…., perfect for summers..
wow.. icecream looks great & delicious..Thxs for trying my recipe..
Hey Anu, fantastic! The color looks naturally yellow! I did make similar one from Deeba’s and added finely cubed alphonso (sweet one) it tastes yum to have those tiny cubes to chew along wt ice cream! Pls do try it next time, u will fall in love wt it! Hello My first time here. Your site is very interesting. The quilling projects are way too cool.